I traveled with my bike this year by airplane. Using a hard case as my bike transport method, I was shocked to be stuck with a $150 ‘bike fee’…EACH WAY. I did the math, and I was actually paying about 10 bucks an hour that vacation to ride my bike. Silly. Later, a racer buddy of mine showed me his SunLite ‘Bike in a Bag’ soft case which was pounds lighter and didn’t require the ridiculous airline bike fee due to it’s smaller size and lower weight. It had all the room he needed for his bike, wheels and gear, was easy to transport with a shoulder strap and wheels, and after one use, it had paid for itself. I was sold. The SunLite ‘Bike in a Bag’ soft case is also perfect for transporting your bike by car if you don’t want grease, dirt and road/trail grime from the bike in the vehicle. 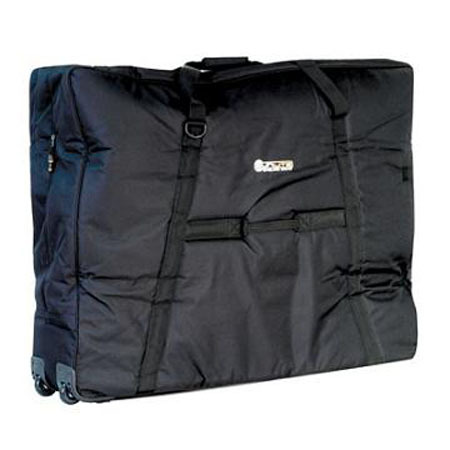 If you are planning at least one trip this year by airplane with your bike, at $189 the most sensible choice is the SunLite ‘Bike in a Bag’ soft case.